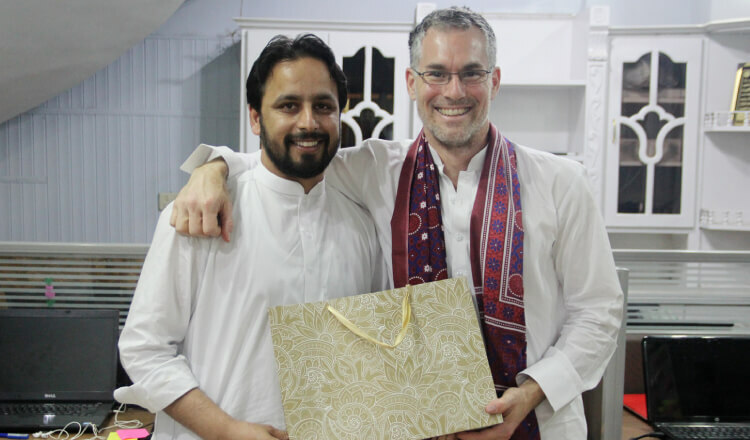 Founders of Troon Technologies, Muhammad Mehboob (Isaac) (left) and Paul Dube (right), meet for the first time in Pakistan. Paul Dube and Isaac Gaither were building a numerology system for Troon’s first client when their team ran into trouble. Frantically working in Canada, Paul reached out to Isaac in Pakistan and the partners hopped online to solve the problem. The connection was poor and communication lagging but they worked together to find a solution. Then Paul heard something in the background: roosters. Unbeknownst to Paul, Isaac was making the long trek by bus to his hometown, a small village four hours from Islamabad. When Paul texted, Isaac immediately hopped off on the side of the road, found a nearby house, and climbed onto the roof to help. Whatever has to be done! Thanks to fierce commitment to the client and to each other — as well as some rooftop hospitality — Isaac and Paul solved the problem and delivered results. That’s how you build a connection. That’s how you build a relationship. And that’s how Paul and Isaac have built this company. About 10 years ago, Paul, a long term entrepreneur, was building an app and having difficulty finding reliable developers that didn’t charge a fortune. His search led him to a business duo who had access to engineers in Pakistan. “We can do this,” they assured Paul. Well, they couldn’t. He went through a few developers without success. Paul was about to give up when they brought in Isaac. Despite the language barriers — at that time, Isaac was not fluent in English — Paul was immediately drawn to Isaac’s engaging, compassionate energy. And he’s a great engineer! Jarret Leaman leading a team session in Pakistan. Over the next seven years, Paul and Isaac logged hundreds of hours of conversation over phone, text, and Skype. They had to work around language and time zone differences and the lapses in communication that burgeoning virtual communication options often suffered. He and Paul, however, managed to find plenty to discuss. Both were intensely interested in the other’s culture and life. They spoke almost daily, spending an hour on business and two on getting to know, and understand, each other. No subject was off the table — politics, religion, spirituality, marriage — and differences were met with curiosity instead of judgment. Isaac says, “From the very beginning, we had personal discussions about life and our countries and societies. These interactions made me feel that we are the same kind of personalities.” Paul admits he probably spoke more to Isaac than his own wife at that time! Waiting for Paul to arrive at the beautiful new Islamabad airport, Isaac was brimming with excitement. “Paul is the most known person in my family!” He arranged a welcome party with members of his family and the work team. Isaac says his wife told his brother, both of whom witnessed the emotional meeting, that Isaac had never been so happy — even at their wedding! Paul Dube arriving in Pakistan to a warm welcome. To be fair, though, Isaac, his family, and Troon’s team, went out of their way to make Paul feel at home. They cooked for their visitor and gave him gifts from local merchants. Asma, a woman who worked at the office — lovingly nicknamed “Mama Asma”— had asked Paul about his interests. Finding out he and his wife liked gemstones and crystals, she gifted him beautiful stones, as well as a book that everyone at the office had signed with personal messages. While meeting Isaac was incredible, this was a business trip too. The partners got to work. When they arrived at the office the day after Paul arrived, he was met by the entire staff, who were lined up in the lovely courtyard. While he’d spoken to many online, this was a chance to have personal conversations. The team took advantage! They couldn’t wait to ask questions — about work, cultures, everything under the sun — and to learn more about their North American partner. The visit connected two cultures and closed any divides that language and distance can create. It also cemented Isaac and Paul’s friendship and partnership. The Troon team gather for a group photo. Isaac is equally proud that his company boasts a culture in which everyone works together and that values going “above and beyond” for clients — and for each other. What’s next for Troon? More of the same? When it comes to building connections and prioritizing relationships, absolutely. But as Isaac says, “We are very focused on education, learning, and working on new projects and technologies.” Exciting innovations are on the horizon — and who knows, maybe some more rooftop escapades!